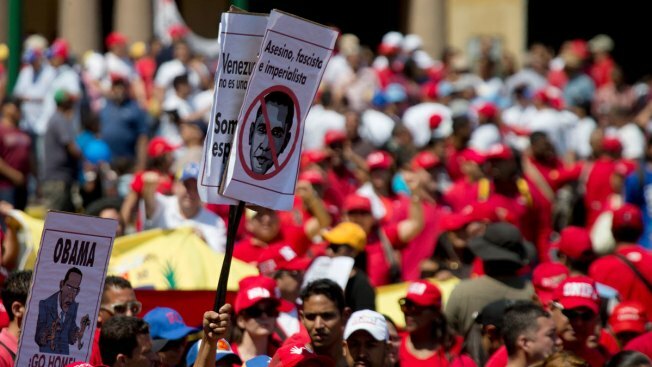 A man holds up posters, one showing an image of President Barack Obama with a message that reads in Spanish; "Assassin, fascist, imperialist", during an anti-U.S. rally, in Caracas, Venezuela, Saturday, March 12, 2016. Hundreds of opponents and supporters of President Nicolas Maduro held rival marches in Caracas on Saturday, with anti-government forces demanding Venezuela's leader step down and his sympathizers denouncing U.S. sanctions on some top officials. The marches were animated but peaceful, unlike massive anti-government protests in 2014 that left dozens dead and barricades burning in the streets. Government critics dressed in white shirts marched through the capital's better-off Chacao district on Saturday, calling for the liberation of detained opposition members they consider political prisoners. "There is no bureaucracy or military gang that can stop us," said National Assembly President and opposition leader Henry Ramos. "Nicolas, save us the tragedy, resign! Do this favor for Venezuela." The opposition blames the socialist-inspired government for the widespread shortages, deep recession and soaring inflation plaguing Venezuela. "I swore that I would never surrender to the oligarchy, under no circumstances," said Maduro, speaking in a central Caracas plaza where the pro-government march ended. He denounced a recent decision by President Barack Obama to renew an executive order that declared a national emergency with respect to Venezuela, a decree used to justify sanctions against officials accused of human rights abuses and corruption. The individuals come from the top echelon of Venezuela's state security apparatus that was responsible for cracking down on the 2014 protests and for pursuing charges against leading opponents. "Respect Venezuela!" shouted government supporters, some holding up signs with images of late Venezuelan President Hugo Chavez. The opposition coalition officially unveiled its multi-pronged strategy for ousting Maduro this week, drawing little reaction from Venezuelans struggling to make ends meet. On Thursday, the opposition-controlled Congress gave preliminary approval to a bill that would put the country on the road to a presidential recall referendum. Lawmakers are expected to give the bill final approval later this month. Members of the ruling socialist party, which controls the presidency and most state institutions, said the legislation amounted to an attempted coup. Venezuelans have grown accustomed to dueling marches in recent years. Government supporters tend to stage counter-demonstrations whenever the opposition calls a rally. Still, Caracas residents had talked anxiously about Saturday's protests, and some said they had made plans to avoid the city in case violence broke out.